I have been quite inspired by the work of Ruth Rae. 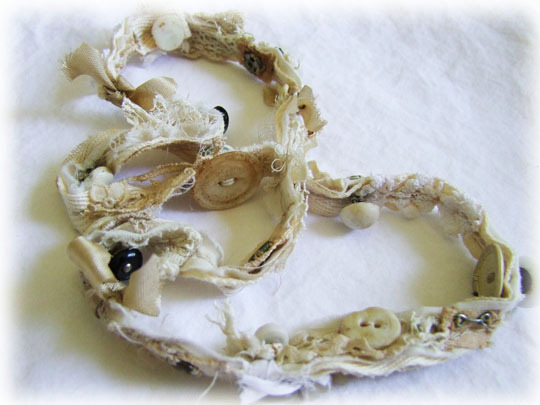 Ruth has such a talent for transforming vintage buttons, lace and bits into beautiful jewelry. I decided to gather up my supplies and give it a go. I originally planned to create a wrap-around bracelet but it ended up being too big, so now it is a necklace! Supplies: twill, vintage buttons, emroidery thread, sewing machine, seam binding, lace pieces and snaps.